This report is intended to assist flood management planners and engineers in characterizing facilities within the State Plan of Flood Control (SPFC) and to inform the 2017 Central Valley Flood Protection Plan Update (2017 CVFPP Update). The 2017 FSSR provides a concise repository of the status of SPFC Facilities as noted in related DWR evaluation and inspection efforts, along with the efforts of our local and federal partners. The 2012 CVFPP laid the foundation necessary for compliance with the Central Valley Flood Protection Act of 2008 and a new approach to flood management in the Central Valley. As a supporting and informational document to the 2017 CVFPP Update, the 2017 FSSR includes information about inspecting and evaluating SPFC facilities. It also details and quantifies major components of existing flood risk within the Sacramento and San Joaquin river watersheds, and the factors that influence flood risk in relation to the various flood control structures within the SPFC. Additionally, the 2017 FSSR informs and details the current conditions of levees and channels within the SPFC, and includes finalized project information from DWR’s Levee Evaluations Program. Through updating the status of SPFC facilities, the State of California can continue to make informed decisions related to flood risk management. 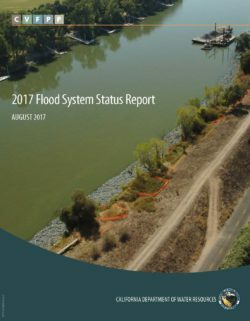 This document is a collaborative effort by DWR, local, and federal partners, signifying a step forward in gaining deeper understanding of the flood system’s current status and condition in the Central Valley. Federal regulations define the ordinary high water mark (OHWM) as “that line on the shore established by the fluctuations of water and indicated by physical characteristics such as a clear, natural line impressed on the bank, shelving, changes in the character of soil, destruction of terrestrial vegetation, the presence of litter and debris, or other appropriate means that consider the characteristics of the surrounding areas” (U.S. Congress 1986). Under Section 404 of the Clean Water Act (CWA), the OHWM defines the lateral extent of federal jurisdiction in non-tidal waters of the United States (WoUS) in the absence of adjacent wetlands (U.S. Congress 1977). Thus, accurate and consistent OHWM delineation practices are essential for proper implementation of the CWA. The dynamic nature of stream systems and fluvial processes presents challenges for OHWM delineation. Natural sources of variability in river and stream systems (e.g., climate, sediment supply, landscape position, etc.) are compounded by direct and indirect anthropogenic sources of variability (e.g., watershed alteration, dam emplacement and removal, climate change, etc.). Thus, it is challenging to impose a consistent measure of “ordinary” high flow conditions across systems in which the hydrology and geomorphology can vary greatly in both space and time. OHWM delineation in non-perennial (i.e., intermittent and ephemeral) streams can be especially challenging. The U.S. Army Corps of Engineers (USACE) defines intermittent streams as having “flowing water during certain times of the year, when groundwater provides water for stream flow. During dry periods, intermittent streams may not have flowing water. Runoff from rainfall is a supplemental source of water for stream flow” (USACE 2012). Ephemeral streams have “flowing water only during, and for a short duration after, precipitation events in a typical year. Ephemeral stream beds are located above the water table year-round. Groundwater is not a source of water for the stream,” and “[r]unoff from rainfall is the primary source of water for stream flow” (USACE 2012). In contrast to both intermittent and ephemeral streams, perennial streams have “flowing water year-round during a typical year. The water table is located above the stream bed for most of the year,” and “[g]roundwater is the primary source of water for stream flow” (USACE 2012). Given the less persistent streamflow regimes characteristic of non- perennial streams, particularly ephemeral systems, the characterization of ordinary high water flows is perhaps more challenging than in perennially flowing systems. Moreover, depending on climate, vegetation, and other related factors, the appearance of some OHWM indicators may vary greatly between wet and dry seasons or between relatively infrequent flow events, more so than in many perennial streams. Mountainous terrain can present additional challenges to OHWM delineation. For instance, the relatively steep and confined valleys in which mountain streams commonly flow can restrict the development of some alluvial features (e.g., flood-plains, bankfull benches, etc.) that are typical of low-gradient systems and that may help to identify the OHWM. Thus, in non-perennial mountain streams, it is often difficult to determine what constitutes ordinary high water and to interpret the physical and biological indicators established and maintained by ordinary high water flows. Challenges and inconsistencies pertaining to OHWM delineation practices are becoming increasingly relevant in mountainous parts of the western U.S. in light of expanding development. This increased pressure on fluvial systems highlights the need for accurate, consistent, and repeatable OHWM delineation practices in this region. These factors, combined with the particular challenges of OHWM delineation in non-perennial mountain streams, provided the impetus for developing this delineation guide. 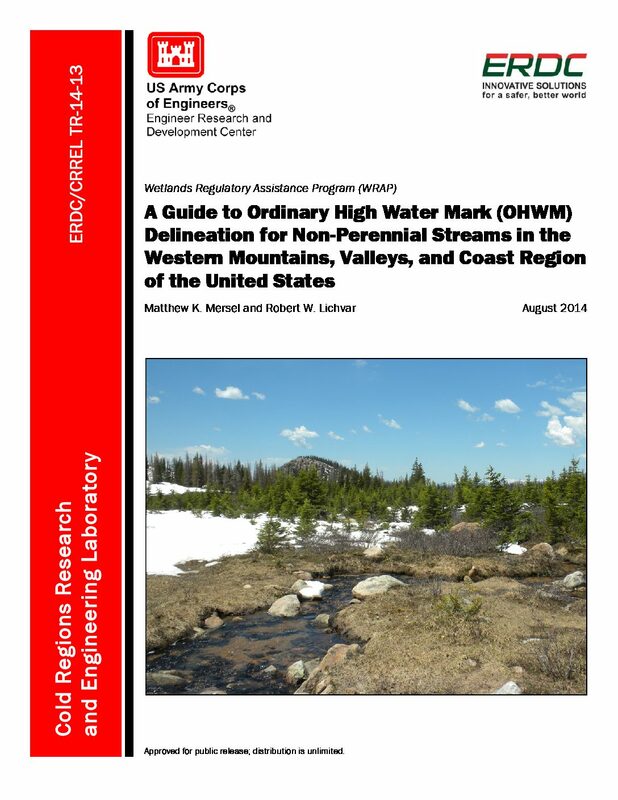 This guide presents the concepts, field indicators, and methods for assessing, delineating, and documenting the OHWM in non-perennial streams in the Western Mountains, Valleys, and Coast (WMVC) Region of the United States (Figure 1). The information presented here is based on the findings of Mersel et al. (2014) (discussed in Section 1.5) and on years of field observations and data gathering in the WMVC Region and in other regions of the U.S. by the authors and other contributing experts. The remainder of Section 1 provides background information regarding the concept of the OHWM and pertaining to stream hydrology and geomorphology in general. Section 2 discusses and provides examples of the specific field indicators used to identify the OHWM in non-perennial streams in the WMVC Region. Section 3 discusses field methods for delineating the OHWM and addresses additional techniques and lines of evidence that may help in problematic delineation scenarios. The information presented here is technical guidance and does not define, amend, or replace any existing regulations, laws, or legal guidance related to the OHWM or to the regulation of WoUS. Furthermore, determining whether any stream is a jurisdictional WoUS is beyond the scope of this document and involves further assessment in accordance with regulations, case law, and clarifying guidance. This guide pertains to non-perennial streams in the WMVC Region of the U.S., and while the information presented here may have a wider applicability to other regions or to perennial rivers within the WMVC Region, this has not been tested or validated. This manual serves as a companion to A Field Guide to the Identification of the Ordinary High Water Mark (OHWM) in the Arid West Region of the Western United States (Lichvar and McColley 2008) as these two regions—the WMVC and the Arid West—are interspersed with one another. Best professional judgment is required to determine which manual is most appropriate for any given location within these two regions. The technical guidance presented here aims to provide an informed and consistent approach to OHWM delineation within the WMVC Region; however, OHWM delineation is not a precise practice. The OHWM can take on a variety of appearances and characteristics and may change over time due to natural or anthropogenic causes. Best professional judgment and consideration of the unique characteristics of each project site are always required. Watersheds recently burned by wildfires are recognized as having an increased susceptibility to debris flow occurrence. The great majority occur within the first 2 years following wildfires. These debris flows are generated primarily through the process of progressive entrainment of material eroded from hillslopes and channels by surface runoff and appears independent of the vegetative community burned. The decreased likelihood of debris flows over time is linked to the restoration of hydrologic function as vegetative cover and soil infiltration functioning return to pre-fire conditions. An exception to this pattern of post-wildfire debris flow susceptibility occurs in burned drainage basins with forest cover. A second, later period of increased debris flow susceptibility due to infiltration-triggered landslides can occur in burned forested basins. This later period of debris flow susceptibility is largely attributable to the fire-induced tree mortality and subsequent decay of tree root networks decreasing soil strength on steep hillslopes which produces an increased likelihood of debris flow occurrence 3 to 10 or more years after the wildfire. 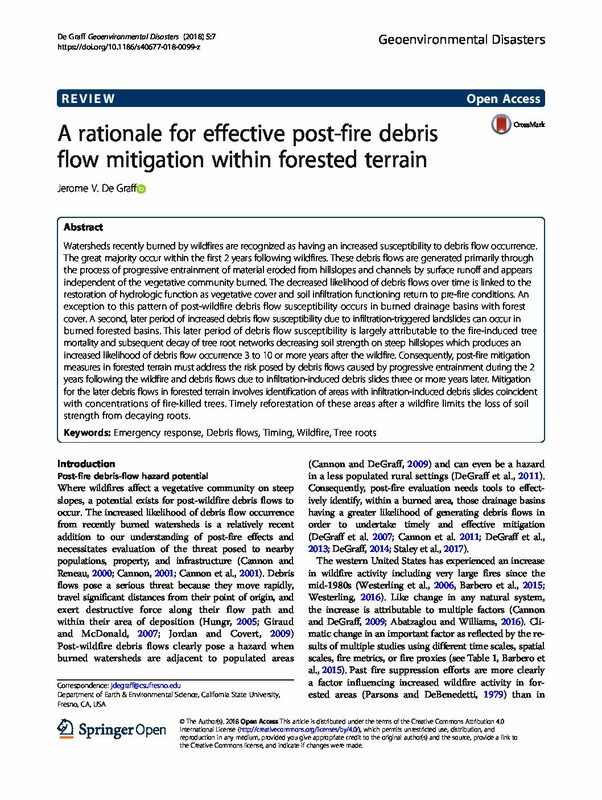 Consequently, post-fire mitigation measures in forested terrain must address the risk posed by debris flows caused by progressive entrainment during the 2 years following the wildfire and debris flows due to infiltration-induced debris slides three or more years later. Mitigation for the later debris flows in forested terrain involves identification of areas with infiltration-induced debris slides coincident with concentrations of fire-killed trees. Timely reforestation of these areas after a wildfire limits the loss of soil strength from decaying roots. Debris flow velocities are commonly back-calculated from superelevation events which require subjective estimates of radii of curvature of bends in the debris flow channel or predicted using flow equations that require the selection of appropriate rheological models and material property inputs. This research investigated difficulties associated with the use of these conventional velocity estimation methods. Radii of curvature estimates were found to vary with the extent of the channel investigated and with the scale of the media used, and back-calculated velocities varied among different investigated locations along a channel. Distinct populations of Bingham properties were found to exist between those measured by laboratory tests and those back-calculated from field data; thus, laboratory-obtained values would not be representative of field-scale debris flow behavior. 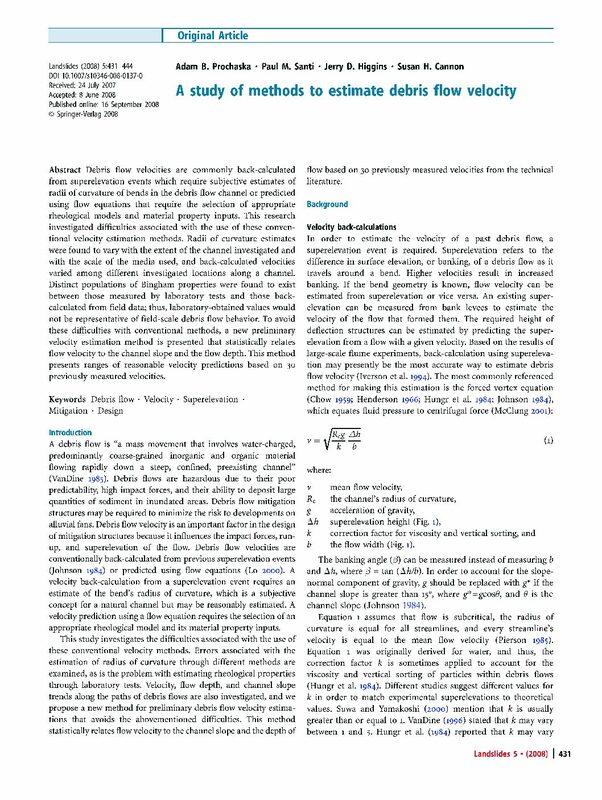 To avoid these difficulties with conventional methods, a new preliminary velocity estimation method is presented that statistically relates flow velocity to the channel slope and the flow depth. This method presents ranges of reasonable velocity predictions based on 30 previously measured velocities. During Northern Hemisphere winters, the West Coast of North America is battered by extratropical storms. The impact of these storms is of paramount concern to California, where aging water supply and flood protection infrastructures are challenged by increased standards for urban flood protection, an unusually variable weather regime, and projections of climate change. Additionally, there are inherent conflicts between releasing water to provide flood protection and storing water to meet requirements for the water supply, water quality, hydropower generation, water temperature and flow for at-risk species, and recreation. 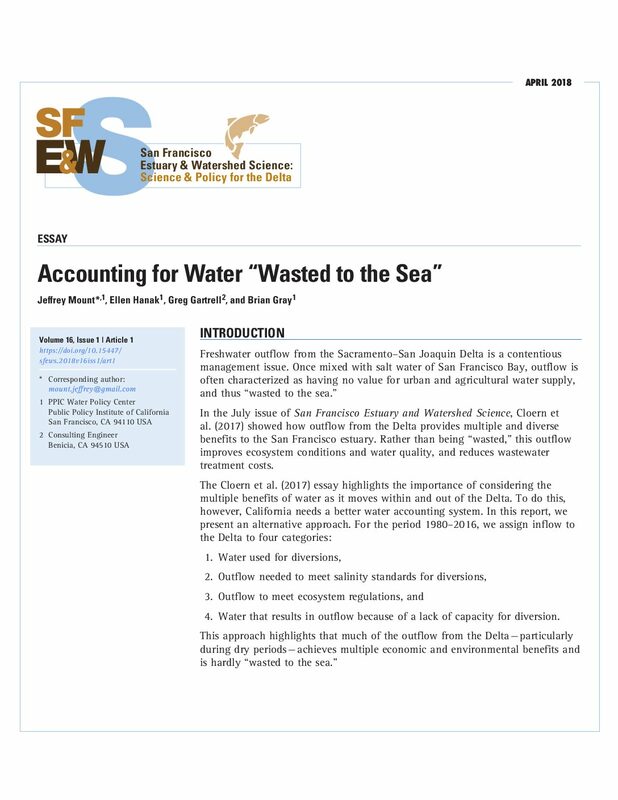 To improve reservoir management and meet the increasing demands on water, improved forecasts of precipitation, especially during extreme events, are required. 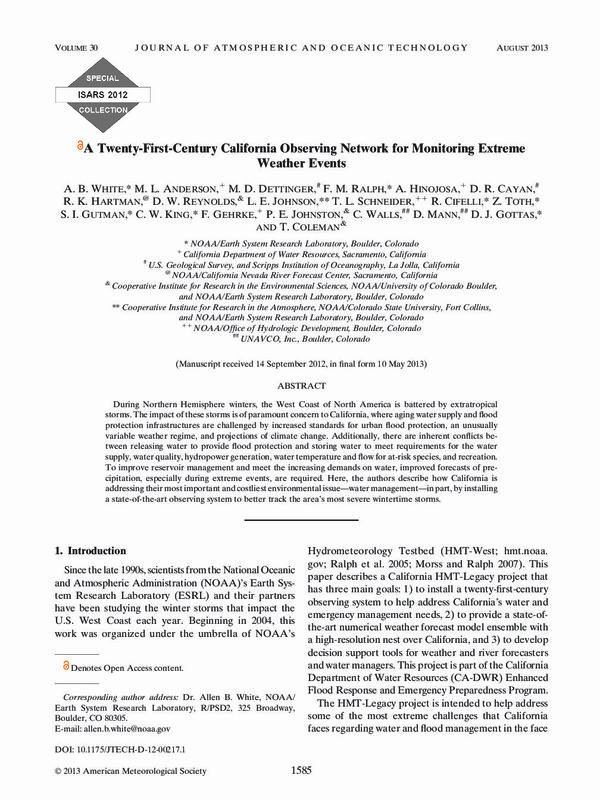 Here, the authors describe how California is addressing their most important and costliest environmental issue-water management-in part, by installing a state-of-the-art observing system to better track the area's most severe wintertime storms. 4. Water that results in outflow because of a lack of capacity for diversion. Among the potential impacts of climate change, accelerated sea level rise and a reduced Sierra snowpack are the most certain. Both will pose significant challenges for water supply and flood management. Water utilities have already begun to plan for these changes, but flood control agencies are lagging behind and face greater regulatory constraints. State leadership is needed to resolve some threats, including the risk of catastrophic failure in the Sacramento-San Joaquin Delta. 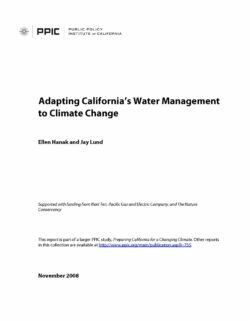 This report was prepared as part of the Preparing California for a Changing Climate project. California’s highly variable climate and growing water demands combine to pose both water-supply and flood-hazard challenges to resource managers. Recently important efforts to more fully integrate the management of floods and water resources have begun, with the aim of benefitting both sectors. California is shown here to experience unusually large variations in annual precipitation and streamflow totals relative to the rest of the US, variations which mostly reflect the unusually small average number of wet days per year needed to accumulate most of its annual precipitation totals (ranging from 5 to 15 days in California). Thus whether just a few large storms arrive or fail to arrive in California can be the difference between a banner year and a drought. Furthermore, California receives some of the largest 3-day storm totals in the country, rivaling in this regard the hurricane belt of the southeastern US. California’s largest storms are generally fueled by landfalling atmospheric rivers (ARs). The fractions of precipitation and streamflow totals at stations across the US that are associated with ARs are documented here and, in California, contribute 20–50% of the state’s precipitation and streamflow. Prospects for long-lead forecasts of these fractions are presented. 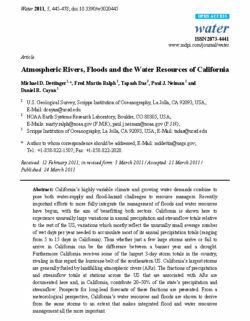 From a meteorological perspective, California’s water resources and floods are shown to derive from the same storms to an extent that makes integrated flood and water resources management all the more important. The Thomas Fire burned 114,078 ha in Santa Barbara and Ventura counties, southern California, during December 2017–January 2018. 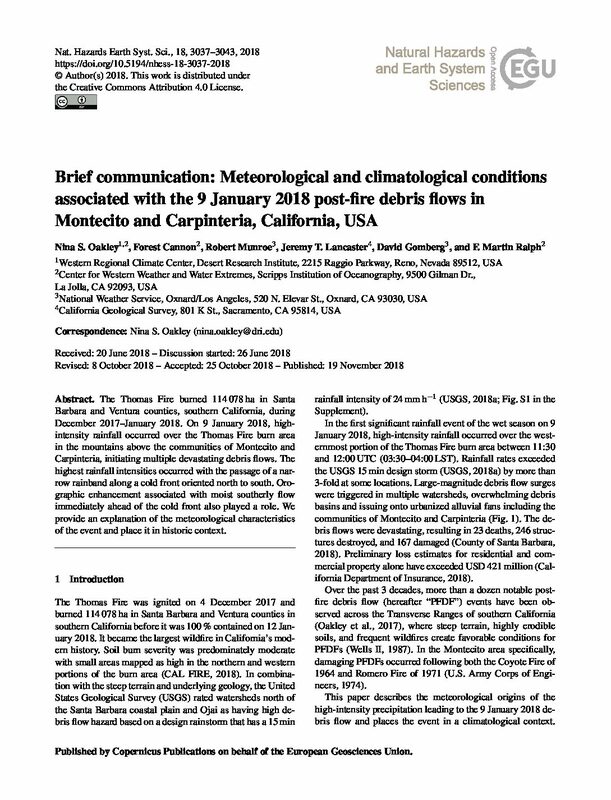 On 9 January 2018, high-intensity rainfall occurred over the Thomas Fire burn area in the mountains above the communities of Montecito and Carpinteria, initiating multiple devastating debris flows. The highest rainfall intensities occurred with the passage of a narrow rainband along a cold front oriented north to south. Orographic enhancement associated with moist southerly flow immediately ahead of the cold front also played a role. We provide an explanation of the meteorological characteristics of the event and place it in historic context. California is at risk for catastrophic flooding that could have wide-ranging impacts due to the size of its economy and the number of people residing in the state. The State’s economy ranks ninth globally; therefore, the consequences associated with its potential exposure to property damage, economic harm, and loss of life are great. California is the nation’s most populous state, ranks third largest in land size, and has widely varying climates and topographies, all of which make developing one-size-fits-all solutions to flood risk management impracticable. In California, 20 percent of the almost 38 million residents live within 500-year floodplains (i.e., have a 0.2 percent chance of flooding in a given year). Four of the nation’s 15 largest cities are in California (Los Angeles, San Diego, San Jose, and San Francisco), and all are at risk for some type of flooding. These factors make decisions regarding California’s flood risk management policies and financial investments vital to the State and the nation. 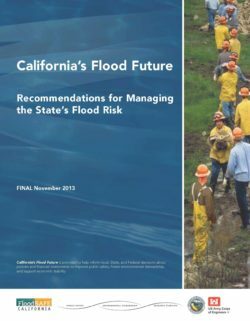 This report, California’s Flood Future: Recommendations for Managing the State’s Flood Risk (Flood Future Report) presents an overview of the flood threats facing the state, approaches for reducing flood risk, and recommendations for managing California’s flood risk. The Flood Future Report is the first statewide report to be developed through collaboration between the California Department of Water Resources (DWR) and the United States Army Corps of Engineers (USACE). As a joint report by the State and Federal governments, the document represents an unprecedented level of intergovernmental cooperation, including tribal entities.1 Additionally, this report would not have been possible without the participation of and information shared by more than 140 local flood management agencies. The Flood Future Report represents the first characterization of flood management activities and exposure to flood hazard throughout each county and hydrologic region of the state. This statewide assessment is intended to provide valuable information for local, State, and Federal decision makers as they chart California’s complex flood management future.